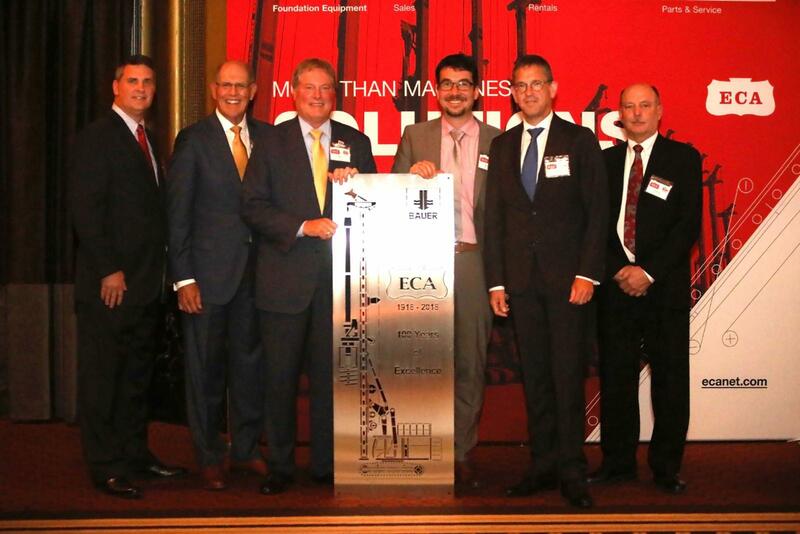 More than 400 attendees arrived in downtown Pittsburgh, PA on the evening of June 1, 2018, to celebrate the 100-year anniversary of Equipment Corporation of America (ECA), a leading distributor of foundation construction equipment. The attendees represented industry leaders, family, and friends, from the United States, Canada, and Europe. The event kicked off with a cocktail reception at the Heinz History Center amidst the symbols of Pittsburgh’s rich industrial heritage – a fitting location for a century-old supplier with local roots. The guests were then shuttled to the Omni William Penn Hotel for a formal sit-down dinner and dancing. The highlights of the event included a colorful talk and slideshow presentation by CEO Roy Kern with photos and stories from the firm’s history; a few words from Roy’s father Al whom served as CEO from 1965 to 1986; entertaining comments from President and long-time employee Ben Dutton; and the presentation of engraved platters commemorating 100 years of business to the Kern family by Vice President of Sales & Marketing Jeff Harmston and Marketing Manager Kelly Simon. Highlights also included public recognition for past and present employees and business partners that made the momentous occasion possible.